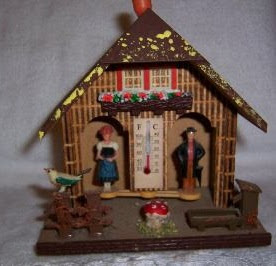 My aunt who lived next door had a thermometer like this one. I always thought it was cute, especially since we didn't have anything this interesting at our house. She said the man and woman were supposed to come out of the door, one when it was sunny and one when it was raining, but I never saw it work. Posted by Karen at 3:14 p.m.